Sitting on an extra large private lot just steps from the river this home is a true oasis in the centre of town. Everything has been done for you. Like living in a brand new home yet in a quaint older neighbourhood. Enjoy morning coffee on the balcony off the second floor master overlooking your private garden. The luxurious en-suite features heated honed marble floors. Walk-in closet offers lots of storage. Exit the master into the large second floor family room/ study or workspace. First floor offers two more bedrooms, another luxurious bathroom with heated floors, main floor laundry room, spacious living and dining rooms, and gorgeous professional kitchen. French doors expand the dining area out to the enourmous deck in your back yard oasis. The lower level offers another finished family room, 4th bedroom, 3 piece bath, gym area and workshop. And something you don’t expect in town – an oversized double garage with loft! 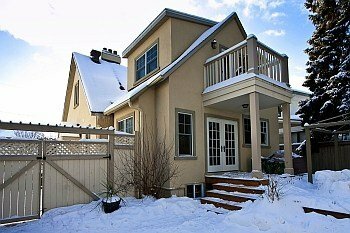 Location Location – located on a quiet cul-de-sac in quaint Ottawa East – just a few houses from Brantwood Park and the River – it’s like a hidden gem in the heart of Ottawa. Brantwood park enjoys a pool, community rink, little league baseball, house league soccer for children 6 to 8, 2 tennis courts, play structures, small basketball court. Ottawa East Community Association offers many programs at the town hall including Yoga. Walk to the Main Street Market from June to October, quick buses to shopping at Billings Bridge or Rideau Centre. A 5 minute walk to the famous Rideau Canal, steps from walking and bike trails. Upgrades galore – to name just a few – Top to bottom reno and 12×22′ addition on 2 floors with full basement in 2006, new central air – 2009, furnace 2005, in 2006 – roof with 25 year shingles, insulation, electrical, plumbing, stucco all around, eavestroughs 2007, new stove/dishwasher in 2006, custom kitchen with pull-out island and cast iron Kohler sink, all Kohler sinks/toilets, Pella architectural custom windows and doors, new sumppump and backup sump in 2006, waterproofing membrane and weeping tiles also done in 2006. – Click on the attachments below to see the list of upgrades and also the property details. Move in and relax – live the good life! Click here to view the photos! And even more photos!